I've been playing lots of light wargames lately and although they're nice, I wanted to do something a bit meatier. So I've recently started to get back into Victory Games' Carrier after taking a long break from it. After playing Scenario 4: Air Search Officer and finally getting a handle on carrier search operations, I decided to try out Scenario 5: Solomons Brawl. This is a surface-force only scenario set at night around Guadalcanal. The Japanese have four combat forces (C1 and C3 start out as level 2 medium surface forces while C2 and C4 are reported as small surface forces). They are trying to get to Guadalcanal. The scenario rules are a bit odd as it implies 2526 as the objective hex. However, a quick look on the map reveals an objective hex marked in 2527. I couldn't find anything in the errata about this so I'm probably just missing something - but I treated 2527 as the objective hex until I could find my error. The 36,000 ton USS Washington (BB-56) was launched 1st June, 1940. The Americans get three task forces for the scenario. We start with chit pulls for the Japanese in the first phase and get 3 blanks and combat force 1. C1, a medium surface force, is sitting adjacent to US Task Group 62.4. We roll for Japanese intentions on the Close Reaction Table and the Japanese are up for a fight. 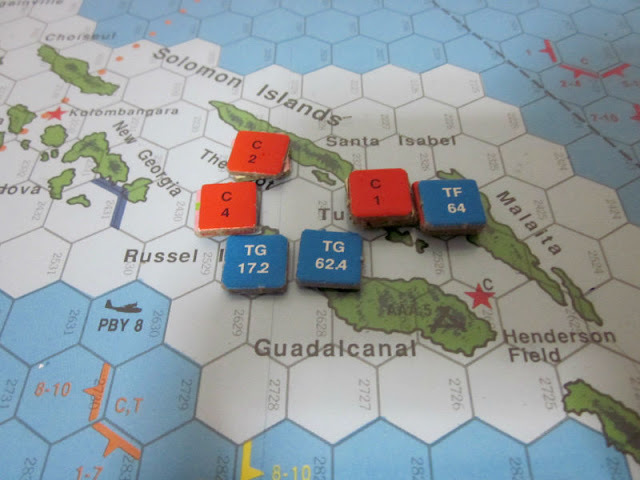 They move into the same hex as the adjacent American ships and engage. A "Located" marker is placed on the C1 task force and we roll it up to level 4. It is a large CA group, with 3 CAs and 2 DDs. The CAs are paired up to shoot at 1 US CA each with a DD left over to shoot at one of the US CAs all by itself. The US has more ships and fires at each Japanese ship with two of its own. The surface engagement is brutal for both sides. The USS Vincennes is sunk. The Japanese lose two destroyers and take 7 hits on one of their own CAs. Both sides have taken 13 total hits so we roll to see who retreats and it is the Japanese. According to the rules, they should go north towards a friendly task force. By the end of the phase, I have tucked in my forces around Guadalcanal a bit by moving TG 17.2 to the east. The rest of the turn sees the Japanese slowly make their way towards their objective hex. The turn starts with a bang as I pull C2 and C3 in the first phase. C2 moves east to 2328. C3 rolls for close reaction and gets a modified roll of 7. The result is USOp and I decide that TF64 will not try to evade the incoming Japanese force. Battlestations! When C3 enters the hex and goes for the engagement, we raise the intel level from 2 to 4. We get a large CA force with 6 CA, 1 CL, and 2 DDs. So much for the small Japanese force that our level 2 intel predicted! BB Washington and BB S. Dakota are engaged by 3 Japanese CA each. Three CAs fire at BB S. Dakota but fail to score any hits. CA Furutaka, Aoba, and Tone inflict 7 total hits on the other battleship, BB Washington. With 18 hit capacity, it's not even heavily damaged. The rest of the Japanese force fails to inflict any hits on my smaller ships. I lick my lips as my battleships prepare to fire back at the Japanese CAs. 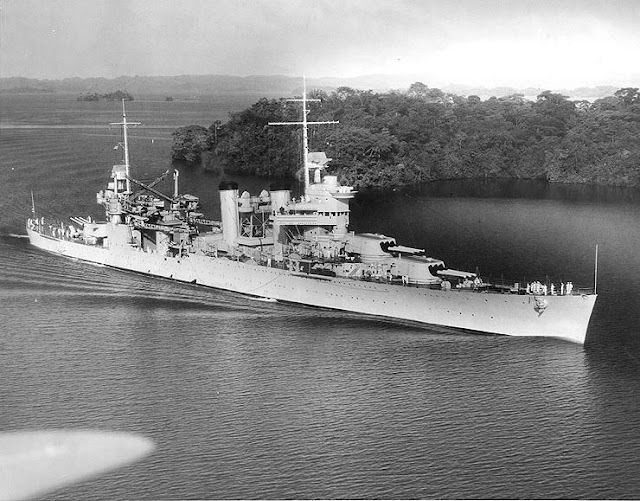 BB S. Dakota hits CA Furutaka for 6 hits but the rest of my task force does no damage to the Japanese. Disappointing! As the US task force has taken 7 hits and the Japanese have taken 6, the US must retreat into hex 2526. Another battle without any real conclusion for either side, it seems. In action phase 3, C4 rolls for close reaction and engages TG 17.2. The Japanese force ends up consisting of 1 CL and 6 DDs. This seems like it should be a pretty even fight. But it's not even close. DD Yukikaze slams 6 hits into DD Hamman and sinks her. Kawakaze sends the Macdonough to the ocean floor. Kurushio sinks the Preston and Akizuki takes out Monssen. Four of the six US destroyers in Task Force 17.2 are sunk in exchange for 1 hit on the Yukikaze and 2 on the Kawakaze. The US tries for revenge by sending TF 62.4 into hex 2427 and the Japanese gladly choose an engagement. CA Maya hits CA San Francisco for 7 hits while the US only manages to sink the Kinugasa and damage CA Maya. The US task force must retreat to 2527 now. A Battle Exhaust 2 is placed on it so it cannot initiate combat. 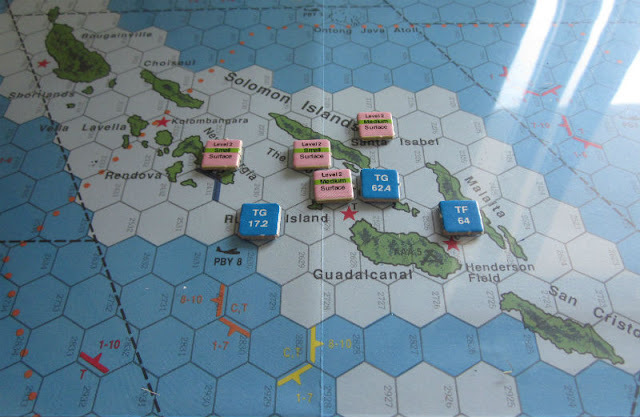 During Phase 3, I move TG62.4 into the same hex as C1 and the Japanese choose to engage. The Japanese pour on the fire and the Maya puts 7 hits into CA San Francisco. The American ships sink the Kinugasa and inflict another 2 hits on CA Maya. TG62.4, having suffered more hits than the Japanese, retreats from the engagement to hex 2527. In phase 4, I decide to send my big guns (TF64) into hex 2426 to try and make up for the losses. I am just hoping for something - anything to turn out in my favor by throwing ships at the Japanese and pleading for the best. What I ended up doing was doubling down further on failure. CA Kako, Chikuma, and Taka inflict 5 hits on BB S. Dakota (a scratch) but CA Tone, Furutaka, and Aoba really dish it out with 11 damage to BB Washington, sinking it. Oh, the humanity! CL Nagara sinks DD Sterett with 2 hits of damage. Mutsuki and Ikazuchi mercifully miss their targets. The Americans inflict a measly 3 hits on the Japanese force, scratching the paint on the Kako but finishing off the Furutaka. TF64 must now retreat as it has taken some serious losses. At this point, I'm thinking the game is over. The Japanese have taken out all my major firepower and they still have plenty to spare. If I were a Star Wars admiral, Darth Vader would have certainly choked the hell out of me by now. US naval forces retreat back towards Guadalcanal as the Japanese advance. 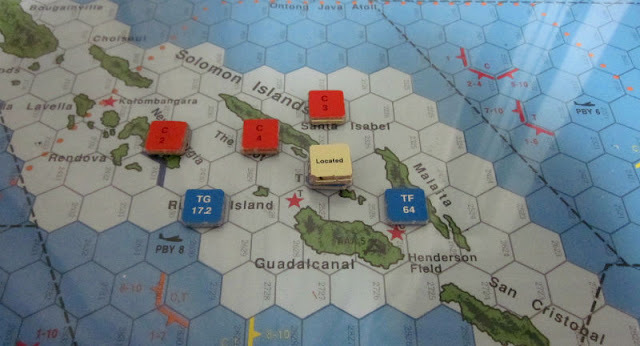 As the US forces have grown from large surface forces to smaller forces, the Japanese basically ignore them as they steam straight ahead to Guadalcanal during turn 3. I pull back all my US forces towards 2527 in hopes of some final big resolution. Two of my groups have Battle Exhaustion 2 and can't initiate combat so the Japanese just sort of saunter into 2527 and start planting their ships off the coast. They enter the hex but do not engage the American task forces. At one point, late in the third turn, TG17.2 manages to scare off C3 for a short while but it returns later in the fourth turn. The game ends without any huge battle that I was hoping for. My task forces are disorganized, exhausted, and considerably reduced in size. The Japanese are largely intact except for a couple of CAs and DDs. They can afford to occupy their objective hex without any fear of opposition, which gives them a bonus to their VP count. The Japanese have 13 VPs while the Americans have only 5 VPs. This is a substantial Japanese victory. I really wonder what I could have done better here. 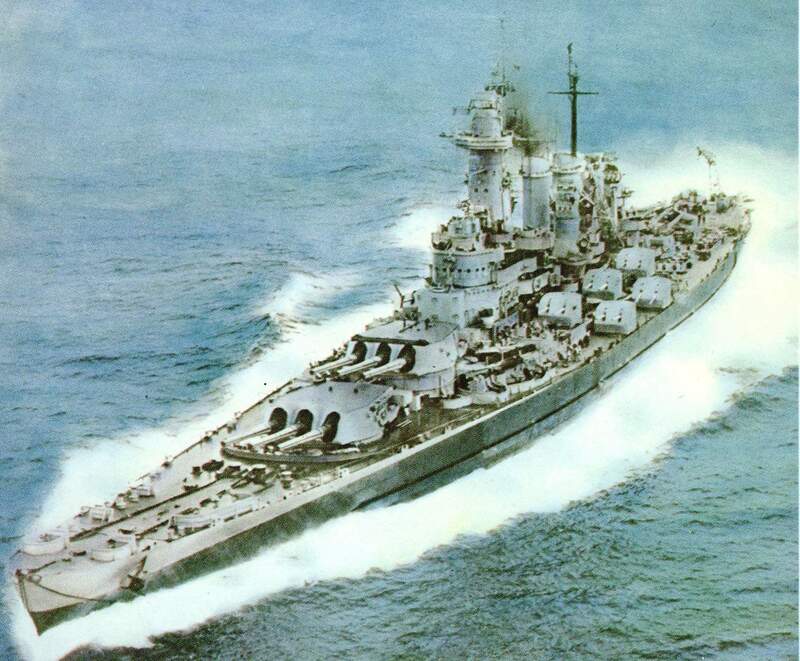 It seems the real turning point of the gamewas either when TG17.2 lost four of its destroyers ships in one battle during turn 2 or when BB Washington was sunk in the next phase. Considering how evenly-matched TG17.2 and C4 were on paper, things should have come out a bit better for me here but the game was probably still salvageable at this point even with the near destruction of a task force. The real loss came when I put my two battleships in unnecessary danger in Turn 2 phase 4. Keeping those battleships afloat helped provide a significant deterrent to Japanese combat forces. Without those large ships, the Japanese can afford to ignore the US task forces and groups and waltz right down towards their objective. I believe this is where I really lost the game. I would like to try this scenario again with an eye to using my ships (especially the Task Force) as deterrents rather than rushing into combat with them. But I didn't read it. I have a copy of Carrier en route and don't want any spoilers. I can't wait to play it! No worries! This game is infinitely replayable. I think you're going to really enjoy this. It's just an excellent design. So many bad things can happen that it almost feels like a comedy of errors at times. I have had a carrier deck full of armed and fueled SBDs ready to launch just before being hit by a huge Japanese air raid. I have sent out entire squadrons to bomb a target based on sketchy intelligence only to find nothing but coral reef. I have had my airfields in Guadalcanal wiped out in a single attack. But that rare time when you do actually manage to launch an air strike on some poor unsuspecting Japanese carrier group and everything goes right -- it just feels awesome to see that happen. There is just no better feeling in the world. Pretty assymmetrical forces. The IJN does have long lances on all of their ships in the battle you named, which in a night combat are deadly. While the 2 US BBs are better than anything the IJN fields here (by far), the problem is that the night battles of Guadacanal were knife fights. A BB is not so great in those because the range advantage is nullified. A two destroyer screen for your battlewagons is insufficient.